The mood of America is moving to free us from the Socialists/Democrats we now have in power. It seems the conservative movement has had to battle the Socialists/Democrats and the ‘established’ Republicans. The Republican Senatorial Committee has definitely not always been in step with the conservatives but when push came to shove ended up supporting the conservative candidate. For far too long we were in a stupor going about our own busy and sometimes complicated lives not paying attention to our elected officials in Washington DC. We had little time to research political figures much less political agendas. Obama drastically has changed this. His insane polices have forced us down a path we don’t want to take and we have taken notice. Today we understand perfectly well how his administration has turned our world upside down. This tyranny gave birth to the Tea Party movement, ordinary citizens just wanting to be heard. Tea Party candidates and how I love them. We all have our favorites and we all know why they are our favorites. The following are candidates who may not be politically savvy, who are naive and who are full of imperfections, still I wish them well. Their strongest attribute is the ability they seem to have in knowingly and candidly verbalizing the problems we are facing. They have rejected the ‘politically correctness’ that has polluted the present political leaders in DC. Sharon Angle has been working in Nevada to Get Out The Vote with Hispanic voters especially since Harry Reid took it upon himself to place all Hispanics into a pigeon hole by saying he did not know “how anyone of Hispanic heritage could be a Republican”. 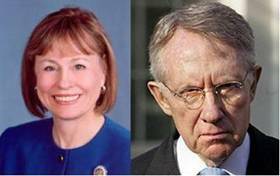 During the senatorial debate on October 15 in Nevada, Angle had the audacity to tell Reid to ‘Man Up’. It wasn’t until this debate did the realization hit home of just how candid and honest she is in sizing up her opponent. Someone should have told Reid to ‘Man UP’ months ago. Listening to Karl Rove’s angry harsh words about Christine O’Donnell made me take a good look at this Delaware candidate running for senator. How could this smiling face be a witch? After all haven’t we all done some pretty stupid things when we were young? It turns out she is not perfect but is that what we are looking for…perfection? We have enough ‘perfect’ senators now voting our great nation into oblivion. It could be that we need a little witchcraft to make some of those Socialist/Democrat senators disappear. 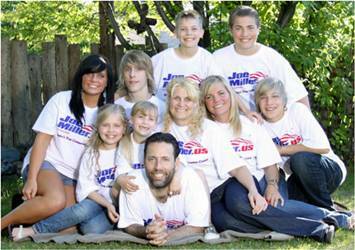 Joe Miller from Alaska ran against a RINO and won. Imagine that! The Republican establishment had such a hard time accepting the will of the people. It seems that the ‘people’ have more faith and common sense on knowing what America must have to beat the Socialists/Democrats than the Republican Senatorial Committee. Miller is definitely not a clone and understands that there is a crisis in Washington DC and that the present leadership must go. He wants to focus on the military and our borders and says that this new political era will bring about the end of ‘entitlement’. Let’s hope for America’s sake he is right. Marco Rubio was supported by Senator Jim DeMint a conservative while the Republican Senatorial Committee supported Charlie Crist a moderate Republican. Senator DeMint has worked hard to support conservative candidates in spite of the fact that he has been criticized and demonized for this. Rubio stood with Arizona on immigration making him a target for the usual racial slurs. Rubio is winning the hearts and minds of the people of Florida and the polls have him winning in November. Star Parker first caught my attention reading her Townhall articles. She has a knack of pointing out the flaws of the Socialist/Democrat party and how they keep the black people down. She has written a book, “Uncle Sam’s Plantation” detailing her own life. In her own words she writes, “I said in that book that indeed there are two Americas. A poor America on socialism and a wealthy America on capitalism”. We need a strong voice like hers in the black community. Sarah Palin has endorsed Parker. Let’s see if Palin’s magic endorsement brings about the desired results needed for Parker’s victory. If voters really care about America’s future, we will be victorious at the end of day on November 2nd. If in fact we don’t send a resounding message to Washington DC on the morning of November 3rd than we are heading down a path of never return. This is not a gloom and doom prediction, just reality. The Socialists/Democrats really have no incentive to go vote other than the scolding from Obama. Whether the Tea Party candidates win or lose depends on how important the American voter wants our nation back on track. Joe Miller: America's Next Alaskan Powerhouse? GOP U.S. Senate candidate Marco Rubio said the federal government is wrong to step in as Arizona rolls out stricter standards for localized immigration control. A benevolent Uncle Sam welcomed mostly poor black Americans onto the government plantation. Those who accepted the invitation switched mindsets from "How do I take care of myself?" to "What do I have to do to stay on the plantation?" Make sure to check out the comments in Facebook.